On March 11, 2011, an earthquake of magnitude 9 occurred off the shores of the island of Honshu, in Japan. The tsunami that followed swept through the coastline of the Tokohu region over nearly six hundred kilometers, making twenty-one thousand victims and disappearances, by obliterating, totally or partially, many cities and port regions. That natural catastrophe led to a series of major accidents in the reactors of the nuclear centre in Fukushima. The very same day, about two hundred and fifteen thousand people living close to the damaged area were evacuated, then, in hundreds of thousands, those living in a radius of thirty kilometers also had to leave. In November 2011 as well as in February 2012, I went onsite, without any preconceived ideas as to what I might do there. I was above all driven the need to confront a reality that escaped me and that my imagination rejected. I covered three hundred kilometers along the coastline, those that had been the most damaged. An extreme desolation reigned there. The gigantic wave had not spared anything. I photographed landscapes without thinking, convinced that I needed time to grasp the cataclysm. In those ravaged places, there was no-one to recount what had occurred. It was a desert: dead, faceless and voiceless. Then I wanted to find the people who lived there before. I went into the areas of the temporary dwellings — the kasetsu jūtaku —, built after the catastrophe to house those homeless people. They are pre-fabricated houses, organized in little villages and look as if they are placed away from the coastline on what are none other than waste lands. Their occupants, mostly old people, attempt by hook and by crook to survive there. Most of them have lost everything, family, friends, homes, animals, and quite often as much as the slightest souvenir that might help them recreate their personal history. Their life was shattered in a few seconds. Aware that I was intruding into those people’s intimacy, but filled with the desire to photograph them and to record their words, I knocked on the doors until some of them were opened. All of them did not wish to receive me. The men and women who agreed to follow me to the photo studio that I had set up in the communal house are surely those whose will to live was strongest. However, on their faces, I read the implacable reality, shot through by as many shadings as there are lives. Those faces were an echo to the destroyed sites. Like a two-piece puzzle in which each element has no option other than to correspond to the other. But they were standing ; they, which the past turmoils had not destroyed , were still ready to face up to the coming ones. As for their testimony, they ended up becoming as essential to me as the portraits or as the places of chaos, adding their motifs to the pattern of a collective fate in which are interwoven the threads of singular stories. In those fragments of life are found side by side, distress or resignation, sorrow or anxiety, as well as a wish to live, an incredible dignity. To capture that subtle and poignant mixture of weakness and strength led me as much to query man’s future in the midst of a world without any bearings, as to grasp the extent of the resources he can deploy faced with adversity. It is the path followed by these survivors in quest of acknowledgment and of renewal that I wished to share and to whom I wanted to pay homage. Denis Rouvre is a French photographer, born in 1967. Lives and works in Paris. 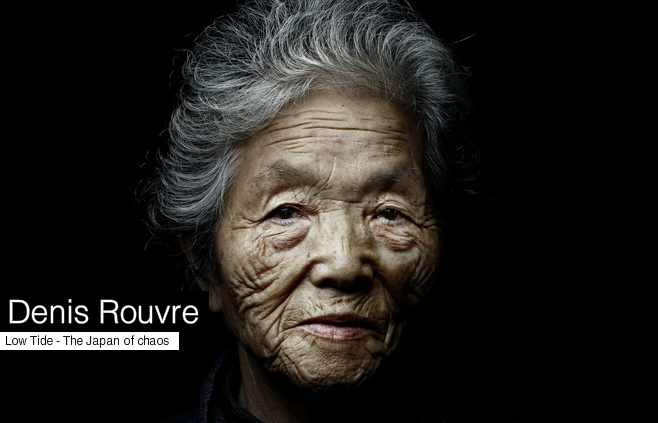 Denis Rouvre’s portraits are published in the national and international media. A portfolio of his work on those who survived the tsunami of March 11, 2011 in Japan was published in the New-York Times Magazine. One of the portraits of that series earned him a 3d prize from World Press Photo 2012, Portraits isolés. He was rewarded by prestigious prizes: 2d prize from World Press Photo 2010 for his series Lamb, 2d prize from SONY World Photography Award 2011 for his series After Meeting and was awarded a Hasselblad Masters Portrait. His latest personal series, seeking out man’s power and frailty, were exhibited in France and abroad. He has also published several books, including Sortie de match in the Éditions de la Martinière. In October, 2012 he will publish two new books with the Somogy Éditions d’art : Low Tide, on the survivors of the tsunami in March 2011 in Japan and Lamb, on the Senegalese fighters. Denis Rouvre is represented in Paris by the Hélène Bailly gallery, in The Hague by the Project 2.0 gallery and in Antwerp by the Axel Pairon gallery.